I sit. I watch. I contemplate. I observe. The stock market appears to have lost all sense of reality and logic. Maybe it never had any. Maybe it is just drowning and the current behavior is the moment before the drowning. The Dow Jones Greek Index is a good barometer of investor behavior. When a person is perilously close to drowning, they will grab on to anything. There are a few seconds of desperate panic. The same holds true for investors. They will grab on to any story no matter how ridiculous it may be. The former nation of Greece is in the news almost every hour. They have debt obligations that they cannot repay and the ECB is going to throw them another $100 billion in bailout money to keep their debt off the default report. To be accurate, the ECB is going to give the $100 billion to the German, French, and American banks that hold the credit default swaps tied to the Greek debt in question. They just needed to figure out how to steal it from the Greeks. Let me touch on one thing before we get to the chart. I referred to Greece as the ‘former nation’ of Greece. Since we are in a new era of government control and central bank intervention, we need new words to describe that which has no current description. The new word we need to commit to our vocabularies is ‘de-sovereigntized’. This is the result of a formerly sovereign nation surrendering to central banking mandates giving the central bank the authority to make laws in that country. The ECB, for instance, will now control Greece’s currency, taxation, debt repayment schedules, and business revenue collection. Greece has agreed to a ECB imposed austerity mandate in which the ECB will determine Greek tax rates, small business taxes, and monetary control. The Greek government no longer has control over key points that determine a nation’s real sovereignty. As a result, we can longer look upon Greece as a sovereign nation. They have ceded their autonomy to the ECB. They have been de-sovereigntized. But stock investors don’t care about sovereignty. They rarely think about anything but making a buck. They rarely actually think! The chart below is the Dow Jones Greek Index. Why do I bring it up. Yes, it is down some 80% from its highs of a few years ago but I think it is a good example of a drowning market. Let us remember that Greece has a GDP of about $300 billion (US) and their economy is shrinking by better than a 4% annual clip. The government has already cut wages and benefits as the government controls more than 50% of the overall economy. The new austerity rules will increase the tax rate on the population by 1% to 5%. The threshold of income that begins taxation will drop from $12k per year to $8k per year. Even the poorest people will feel the oppression of higher taxes. Business owners will be accessed and extra $300 euro penalty for being stupid enough to own a business and hire workers. Like Americans to the American government, the Greek citizens are now enemies of the state. With that in mind, let’s look at the chart. 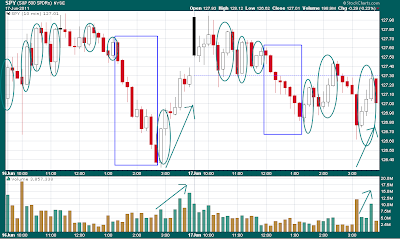 The long, clear candles from the last trading day of May, the third trading day of June, and those of the 16th and 21st were all four or five percent one-day gains. The all came on news that an austerity package had been agreed upon. The gold line on the chart is the S&P 500 so we can see that all indices basically move in the same direction these days. It is pathetic. It is mindless. It is thoughtless. It is a market in the last moments of the drowning process. Why would anyone buy Greece? They admit to be insolvent. Now taxes are going up. Wages are going down. Their economy is contracting. What kind of insanity drives people to put money in an investment like this? Are the last three trading days on the chart an indication of the trend to come? 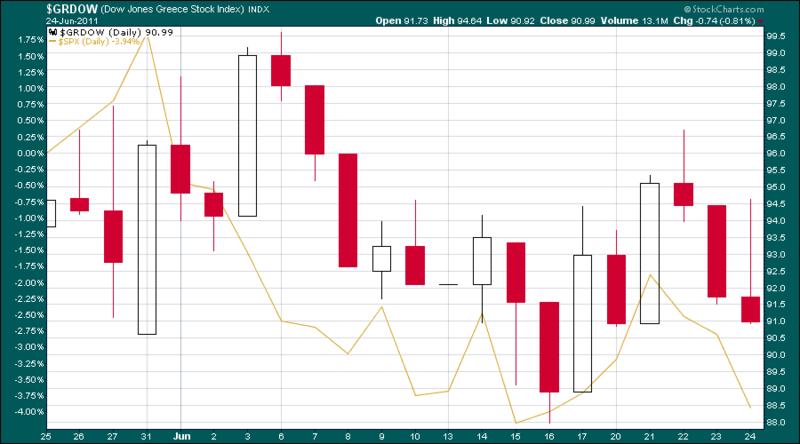 If so, the Greek index will resume its downward slide and most likely, so too with the S&P 500. But wait! Here comes a life preserver. The IEA is going to release 60 million barrels of reserve oil. Of the 60 million barrels, the de-sovereigntized US will be responsible for 30 million barrels. The US no longer controls its currency or taxation. The currency is distributed through the Federal Reserve system and her taxes are deposited in Federal Reserve banks. Here comes a piece of drift wood. The Federal Reserve will continue to buy US debt and equity with maturing assets held on its balance sheet (now at $2.8 trillion). Here comes a piece of styrofoam. The government released some bogus data about economic recovery to excite us. Here comes a piece of plastic. The Plunge Protection Team is bloating up the indices in the last hour of trading. They popped up the Dow some 100 points in the five minutes that followed Greece’s surrender. QE2 is winding down. The major market indices are crumbling. The banks that hold the credit default swaps that are tied to the debt that Greece cannot repay are getting a second bailout in as many years. 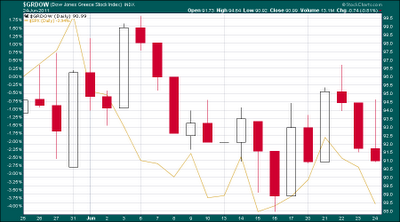 The US indices have been on a six week losing streak. But hey! Don’t worry about it. The PPT is back! Yes, just in time to avert a seven week down trend, the Plunge Protection Team (PPT) got busy on 6/16/2011 and 6/17/2011. The PPT is charged with putting arbitrary floors under the market. In other words, they manipulate the indices higher just when they suspect investors need a little shot of confidence. Since the PPT has usurped price discovery from investors, where do they reckon the Dow low to be? Bear in mind, they only want to manipulate price discovery on the down side. Well, let’s take a look at the chart that I have included below. It looks like Dow 12,000 is a level that gets the PPT’s drawers knotted up. Yes, they wanted to make sure we didn’t add another losing week to the down trend and no, Dow 12,000 doesn’t have any real technical significance. It is just a big fat round number the Fed can use for psychological purposes. They want us to be confident. We are already stupid enough to allow the Fed to run our business but they want us to know they are here for us. Dow 12,000 it is! Take a look at the chart. I used blue circles to show the obvious and methodical interference that seemed to arrest every bear attack. 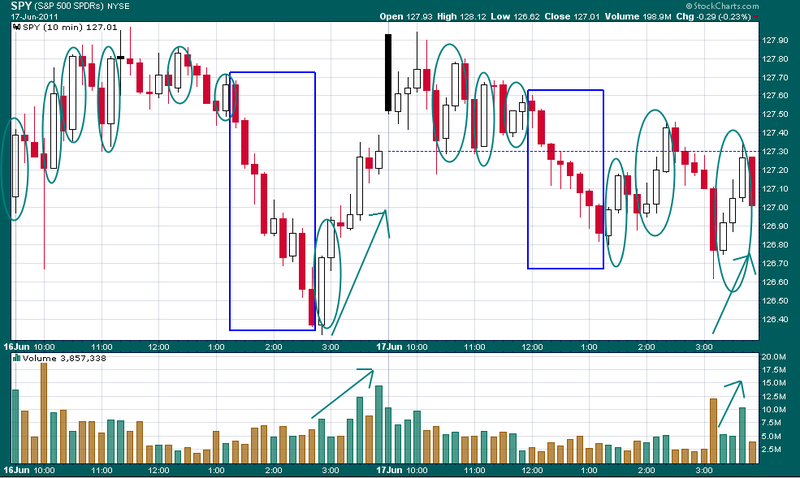 I used green arrows to show the classic PPT end-of-the-day rallies in the final hour of trading. Yes, trading volume grew even in the last afternoon on a Friday. Classic PPT. Just for informational purposes, I used green boxes to show when the PPT went to lunch. The indices melted like butter in June while our heroes were away, But, when they returned, they got right back to work. If an investor had money in the Dow, they made money on the PPT’s effort. But investors should not feel too smug. If they had money in the Dow Jones Greek Stock Index, their money would have appreciated 4.6% on Friday alone! Come on, people! 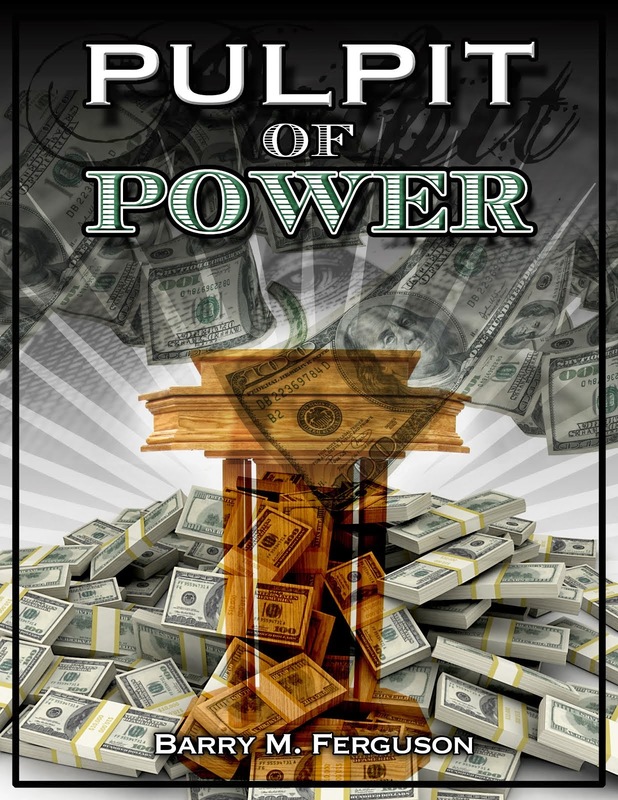 The name of the game is to put your money where your government will manipulate it the most! All the markets are a farce and a scam driven higher by governments to keep the populace placated. Look at the chart. Memorize the pattern. Invest with the PPT. When they go to lunch, close out positions. When they come back from lunch, it is definitely time to go to work. See - it’s simple! No, no - don’t get alarmed. This article has nothing to do with earnings or anything like that. I stopped caring about earnings and other fundamental nonsense years ago. Besides, companies can just make that stuff up anyway. Besides, the stock market cares nothing about earnings and has only moved in recent years based on whatever ‘stimulus’ is coming out of the Federal Reserve. It’s short and simple this week. 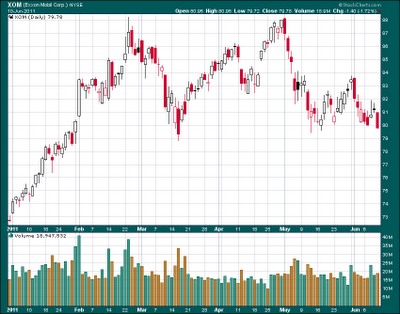 Below is a chart of Exxon. As Exxon goes, so too goes the Dow. The chart of Exxon is a pretty clear head and shoulders pattern that now looks poised to drop the stock price about 10%. Thus, we could make a pretty good bet that the Dow would also drop the same as Exxon. 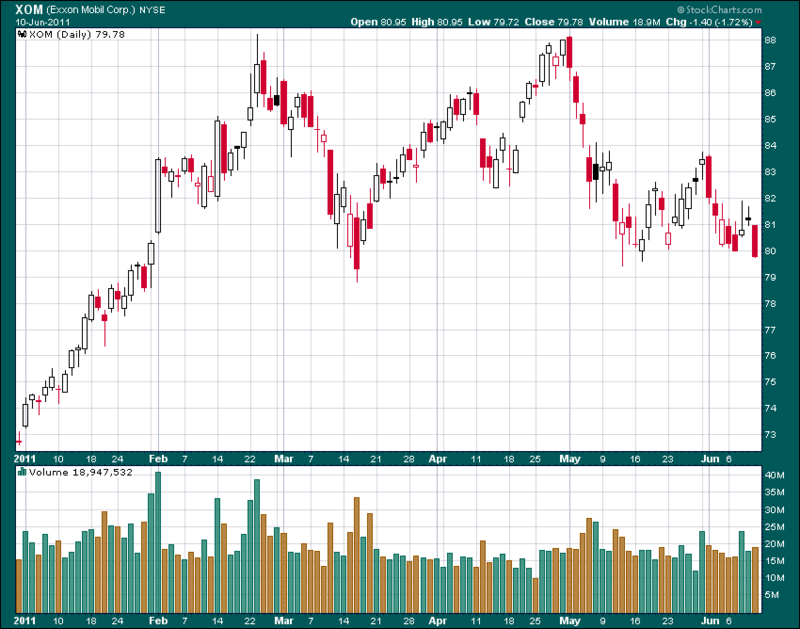 The only thing that would likely pull Exxon out of this bearish pattern is a rising oil price. Oil can only rise if the US dollar weakens. Currencies have to weaken relative to one another and they weaken according to whoever has the most idiots in government. Incredibly, it looks like that prize is going to the European Union as they scramble to bailout Greece and everybody that owns credit default swaps tied to Greek debt. So, it looks like this week turned the tables. The Euro is now beginning to turn lower and that means the dollar has to turn up. Oil should then fall taking Exxon and the Dow with it. After all, the result of having the Fed comically try to drive the stock market is the markets switch from valuation to inflation. Inflation is driven by currency and the US currency looks like it might strengthen for a while. Get prepared for a few ugly weeks ahead. Exxon is trying to tells what lies ahead. June 3, 2011. The Dow Jones Industrial Average has just lost over 400 points in the last 3 days. A lot of investors are wondering what has happened. The bulls have started to wonder why the bears have started up their grills. Why did the markets suddenly take a dive? I have the answer. Come close so you can read this information accurately. Closer. Please, come on in real close. Use a magnifying glass if you need to. Ready? Hear it is. It’s a scam! There you go. The stock market is a scam run by the government to keep the population fooled into thinking the economy is swell. The stock market is a scam propped up by the Federal Reserve to make the idiots of the world think that the Fed has a clue. It is the distraction to make the idiots of the world think that the Fed has a benevolent purpose rather than one of a sinister goal of big banker wealth confiscation. The stock market is nothing more than a big fly trap. And, investors are the flies. Here in the Piedmont of North Carolina, the month of June has begun as it usually does. It is hot and humid. Flies and gnats are swarming as the humidity draws them like a ‘Steve Jobs is still alive‘ alert draws investors to Apple Computer stock. The best way to combat the pesky flies is to hang a fly strip in the garage. Yes, it is low technology but it works better than anything. The strips have been around forever. They are a piece of plastic that is coated with a gooey substance. You pull the plastic out of a canister and leave it hanging from the ceiling. The flies cannot resist the strip as they come in for a landing and then find themselves stuck. Death soon follows. On my first strip, there had to be several hundred of the pests taken out of commission. There were so many flies stuck on this one strip of plastic that I could hardly see the strip anymore. I even watched as one fly buzzed around a few times, landed on the string securing the strip to the ceiling, and then hopped on to the strip joining the multitudes of deceased that lay before him. He struggled momentarily and then went still. Didn’t this fly see the hundreds of other flies trapped and expired on the sticky plastic strip? Why did the fly think his experience would be any different? The stock market is the fly strip that investors cannot resist. Surely the stock market will rise to infinity. The floor of the exchange might be strewn with carcasses of broken investors but they are there because they didn’t have the proper skill. We all think we are different. We all think we have the skill. We all think we have teflon on each of our six feet. We cannot resist. It looks like such easy money. We fly in for a look. We noodle around. Everyone looks happy. The nice folks on the teevee set keep egging us on. There is a daily parade of well dressed men and women appearing on our favorite financial channels and all have the same story. Everything is great! There is no way to lose money. It’s easy. The bull market is eternal. Come on in! We fly in for a closer look. We never see failure - only success. All the other flies aren’t really stuck. They are probably just counting their profits while they rest on the exchange floor. We have to join them. We make our move and put our money to work. Damn!!! We’re stuck!!! I tried to tell the flies that the stock market had become a scam. But no one wants to hear it. That doesn’t play well on the teevee. The last week of May was wondrous. Every day was a positive day in the face of increasingly dour economic news. Yes, the ECB was giving Greece another bailout. Pow! Up went the Dow. Yes, the Fed would no doubt supply another stimulus with a QE3 if needed. Pow! Up went the Dow. Yes, the US Congress met to forge a deal on the debt ceiling. Pow! Up went the Dow. Yes, Steve Jobs is still alive. Pow! Up went Apple and the Nasdaq. Yes, housing prices had made a new low. Pow! Up went the Dow. Yes, the Dow was rising in the face of depressing economic news. Pow! We closed out May with a triple digit rally! We turned the calendar to June. P...P...P...phew! Down went the Dow. 400 points-plus in three days. What happened to the ebullient rally? Did I mention the market was a scam? Oh yeah, we covered that. We are now living in the era of the ‘calendarization‘ of the stock market. Readers may use that term but upon doing so need to send me a payment of $10 dollars as I have unofficially copyrighted its use. The way the scam works is this. May was a bad month. Lower highs and lower lows had turned the Dow into a down trend and un-arrested, threatened to leave the Dow with something close to a quadruple digit loss for the month. And you know what happens at the end of the month? Investment statements are tabulated and issued to investors. Surely the Fed would not want investors to begin to worry about the incompetence of their government. They might begin to question the economic recovery. An ugly monthly statement will do that. So, the solution was to engineer a wondrous end of the month rally that muted the monthly losses incurred in May. In other words, the Fed just thumped a bunch of flies off of the fly strip and acted like there wasn’t a problem of infestation. Investors should have been ready because when the calendar flipped to the month of June, the Fed would stand down from manipulating the market as investors would not receive another statement for 30 days. Down went the markets in the first three days of June. Me? I just took down the old fly strip and put up a new one. The remaining flies will no doubt find themselves irresistibly drawn to the fresh strip and suffer the same fate as their fellow witless associates. In other words, I shorted the infestation. To further the nature of the stock market scam, I would like to turn the reader’s attention to the chart below. It is a two-month chart of the Dow Jones Greece Stock Index. 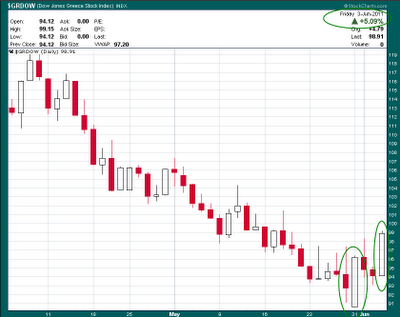 I have circled in green the gains made on Wednesday (June 1, 2011) and Friday (June 3, 2011). That’s right - I said, ‘Gains’. Yes, that’s right - I said ‘Greece’. For perspective, the Dow Jones Industrial Average lost over 250 points on Wednesday and 97 points on Friday. Yet with the Dow down .8% on Friday, the Greece Index was up over 5%. Yes, that’s right - up over 5%. Now, don’t we all feel stupid because we weren’t invested in Greece? Any yes, I am talking about the same sovereign state that is insolvent. Greece cannot pay its debts nor can it repay the first installments of the original ECB bailout package imposed upon her a year ago. The solution was the same solution that ‘fixes‘ everything today. The ECB gave them more loans in another bailout. No, Greece will not be able to repay those loans either but did I mention that the stock market was a scam? Reality does not matter. All that matters today is who is getting a bailout or a stimulus. Greece is getting another bailout. Yippee!! Up go their stock markets. The US central bank is winding down its QE2 bailout. Uh-oh! Down go their markets. What do we take from all this? One, investing money in the stock market is participation in the biggest scam ever perpetrated. Of course, this is fine as long as the participants realize it is indeed nothing more than a scam. Two, the markets are a function of bailouts and stimulus from the hands of the central banks. The central banks will decide who gets cash, when, and how much. Three, the markets are now ‘calendarized’. When investing, pay close attention to where we are in the calendar. Come Monday, we might as well put our money on ‘red - 42’. Wait a minute, there aren’t that many pockets on a roulette wheel. Make that ‘black - 21’! Psst! I saw Bernanke holding his finger on the spinning wheel at about black - 21! As you put your money down, don’t mind that gooey stuff. Besides, it smells so good!